Lakulish Yoga Tallahassee - *Mother Lakshmi is the Goddess of wealth.......spiritual wealth that is and prosperity of the soul in its journey home.....back to the Source! She resides with Lord Vishnu in the 3rd chakra.﻿ We are so delighted to begin 2019 anew with chanting regularly at our sanctuary!The practice of chanting mantras sends healing energy vibrations to the entire body and mind, heart and soul...........it cleanses, it opens, it creates space inside to make room for God, and it washes away the negative thought forms that tend to prey on our mind.........worries, fears, fustrations, and anxieties of all kinds............It brings new vigor and life and healing to the whole central nervous system!Kirtan with Hal and company!Friday and Saturday April 19th and 20thFriday and Saturday April 26th and 27thFor these more intimate gatherings we are not aiming for big crowds.......but rather a small more personal group of chanters who revel in the energy of coming together to chant the many names of the Lord..........and to be swept away by the quiet joy and ecstasy of the process...... and the energy of becoming intoxicated with LOVE! We are so delighted to begin 2019 anew with chanting regularly at our sanctuary! The practice of chanting mantras sends healing energy vibrations to the entire body and mind, heart and soul...........it cleanses, it opens, it creates space inside to make room for God, and it washes away the negative thought forms that tend to prey on our mind.........worries, fears, fustrations, and anxieties of all kinds............It brings new vigor and life and healing to the whole central nervous system! Kirtan with Hal and company! For these more intimate gatherings we are not aiming for big crowds.......but rather a small more personal group of chanters who revel in the energy of coming together to chant the many names of the Lord..........and to be swept away by the quiet joy and ecstasy of the process...... and the energy of becoming intoxicated with LOVE! Kirtan is a powerful medium to transform consciousness....to open our hearts.......to lift our spirits......to give voice to our deepest yearnings....to invoke peace. 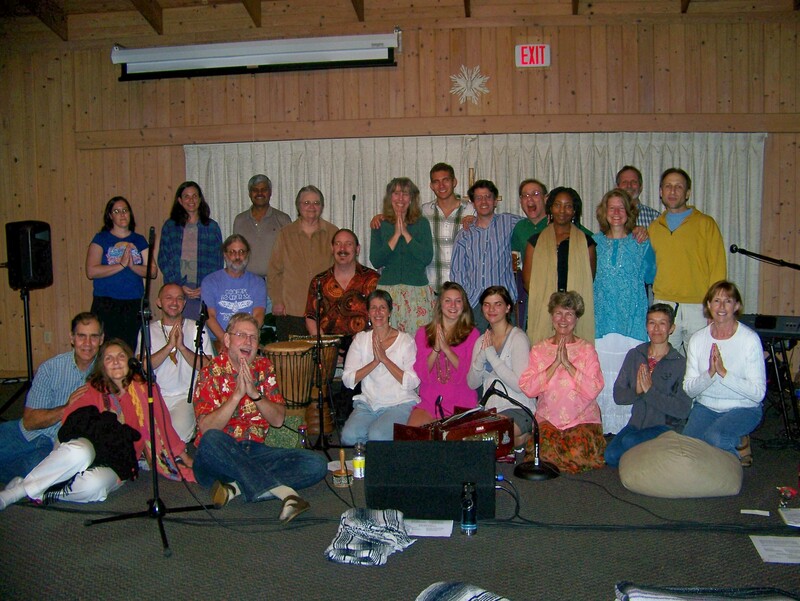 Kirtan is one of the oldest sacred singing traditions of the world. It is fun…….it is easy, and it makes you feel great! We sing in a simple call-and response style repeating simple mantras over and over again until it absorbs every ounce of our attention. There are drums, keyboard, guitar, harmonium and percussion to accompany our voices…...it is interactive and unifying…...it is a natural way to tune into the frequency of LOVE! Check out this article published in the International Herald Tribune and the NY Times on the growing popularity of kirtan! This is a poster we created for our CD release party held September 25, 2009 ANNOUNCING AN EVENING OF CHANTING TO BENEFIT THE BOYS' CHOIR OF TALLAHASSEE AND TO CELEBRATE THE RELEASE OF THE BRAND NEW CD "LAKULISH LOVE"
The CD' s completion is the culmination of a long journey that was set into motion in 2007, and really took on steam when Shri Ashutosh Muni came to Tallahassee and essentially created that fertile ground for newborn faith. "With the help of members of Om Sweet Om, and many other fine musicians of Tallahassee, including the Boys' Choir of Tallahassee, who took part in the challenges and the joys of allowing the music and the chant to move through us, I found that the CD became a physical manifestation of the journey of transformation, the awakening of a newborn faith." says Shyam.